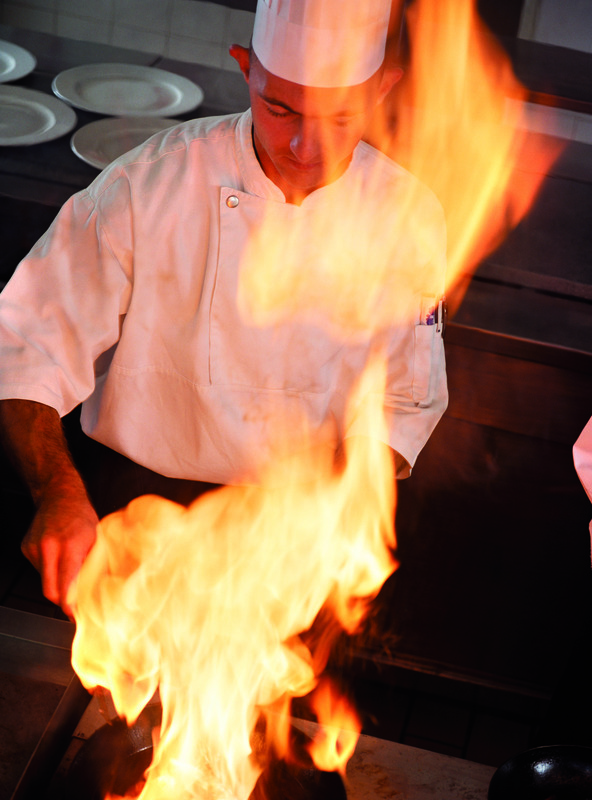 There is no room for complacency when it comes to protecting commercial kitchens from fire. Regardless of size cafés, restaurants, fast food outlets, school canteens and hotel kitchens are all at risk. The recent string of restaurant and bar fires in New Zealand highlights the need for business owners to not only install the correct fire protection equipment, but to also ensure it is regularly serviced and employees are trained to use it. Damage to property is one thing, but the safety of your staff and patrons must be the top priority. An important task for any business owner is to ensure the correct fire protection equipment is installed. This involves identifying and understanding the fire hazards on site, the most significant of which may be the kitchen. Intense cooking heat, flammable oil and the build-up of grease in inaccessible ducts poses significant risks. Kitchens should be fitted with wet chemical fire protection equipment, which is specifically designed to protect against fires involving cooking oils and fats. This can include wet chemical hand held fire extinguishers and for larger facilities, fixed fire suppression systems. Fire extinguishers should be easy to access, clearly labelled and regularly maintained. Fire protection should not end in the kitchen however. In a fire emergency, a complete fire safety system will ensure a high level of protection for facility staff and patrons. Facilities can be fitted with sprinkler systems, fire alarm detection systems, emergency warning and intercommunication systems, emergency lighting and supplementary fire protection equipment, such as hand-held portable fire extinguishers. They may also be fitted with passive fire protection features such as fire doors and walls. In the same vein, fire protection does not stop when fire protection equipment is installed. All systems and equipment must be maintained and regularly serviced to ensure they are in proper working order when an emergency arises. Across Australian and New Zealand all fire protection systems must be maintained in accordance with relevant legislation and standards. It is imperative that regular fire safety training is conducted. This will ensure all employees are equipped to execute emergency fire safety plans and procedures at all times. Fire extinguisher training will educate staff on using the appropriate extinguisher correctly. Evacuation and general emergency awareness training will ensure staff are ready should an emergency arise. I recommend cafe, restaurant and bar owners consult a fire protection specialist to customise a solution for the specific needs for their facility, including its kitchen design and equipment. Wormald offers a range of kitchen-specific fire safety equipment, including wet chemical portable fire extinguishers which are ideal for small café and restaurant kitchens. For larger commercial kitchens, the ANSUL® PIRANHA® system is an agent-plus-water fire suppression systems which is designed for kitchens using high temperature cooking oils. It uses a patented liquid fire suppressant followed with water to provide rapid flame knockdown. This entry was posted in Fire protection planning, Fire safety training and tagged commercial kitchens, kitchen fire protection by wormaldblog. Bookmark the permalink.